Benjamin Earl King known as Ben E. King, was an American soul and R&B singer and record producer. 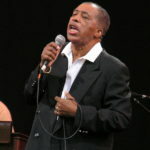 He was perhaps best known as the singer and co-composer of “Stand by Me”—a US Top 10 hit, both in 1961 and later in 1986 (when it was used as the theme to the film of the same name), a number one hit in the UK in 1987, and no. 25 on the RIAA’s list of Songs of the Century—and as one of the principal lead singers of the R&B vocal group the Drifters notably singing the lead vocals of one of their biggest global hit singles “Save the Last Dance for Me”. "Yeah. I’ve been pretty fortunate to travel I guess, all around the place." "He was a manager, one of the singers, I guess talent coordinator for the local talent in Harlem. His name was Lover Patterson. He was living right across the street from where my dad had his restaurant. I guess he saw a lot of kids come in, a lot of my buddies."